Domestic violence victims do not have the same level of access to the civil justice system that victims of sexual assault do, yet both are gender-linked crimes. 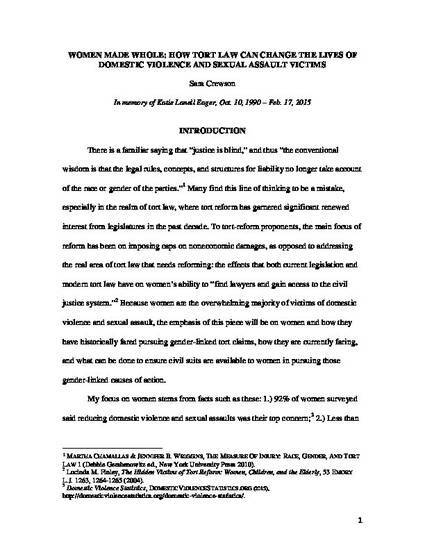 A combination of legal, legislative, and social forces have come together to effectively bar recovery for victims of domestic violence, but when examining how these forces serve to help, rather than hinder, sexual violence victims, it is possible to come up with solutions that can tear these barriers down and ensure all victims of violence are equal in the eyes of the justice system. What we know is that domestic violence tort claims rarely make their way to civil court, while the number of sexual assault claims have exponentially increased by ten to fifteen times the number of claims made 30 years ago. The reason for this is the classification of domestic violence torts as "intentional harms," which most insurance companies do not cover. Domestic violence victims can't sue third-party defendants, and the statutes of limitations for harms like battery and assault offer a far smaller window to act than do other tort claims like negligence. Every day in this country, three women are killed by a current or former intimate partner. Changing the way tort law functions for victims of this type of violence could actually save lives, and now that society is finally having a national discussion about domestic violence, now is the perfect time to act.